If you are registered for Tech Ed Australia this year, come along to MVP Theatre to watch MVPs delivering sessions ranging from 20 minutes to the full 75 minutes. There are only 20 seats in MVP Theatre, so you need to be quick getting to the Expo Hall if you’re serious about catching an MVP Session. The Agenda for MVP Theatre is here (please watch it for last minute updates). To attend, you must be a registered delegate, so if you haven’t bought your Tech Ed ticket yet, you can register here. I’m presenting on Wednesday from 16:00-16:30 on my pet topic generating Word Documents from LOB systems using the OpenXML SDK. Seated attendees to MVP Theatre each receive an MVP Logo wind-up torch keyring (no battery! ), so you need to be quick! You can’t pre-register for MVP Theatre sessions; it’s first in first seated. We all know it, SharePoint is hot and judging from what I'm hearing through the grapevine vNext is going to be even hotter. What I'm also seeing and hearing is that SharePoint ranks very high amongst the skills companies and head-hunters are looking for so now would be a good time for that career change! SharePoint certification would be a good move as well obviously, especially now that the industry recognizes that the MOSS and WSS 3.0 exams are not to be taken lightly. So, act now, go and find a good training, read up, practice and sit in on the exams, how about at Tech-Ed next month? 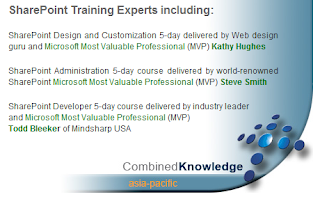 To seriously prepare I'd like to point out that fellow MVP's and SharePoint experts Todd Bleeker, Ben Curry, Steve Smith and Kathy Hughes are hosting a 'SharePoint Summit' in August in Sydney and that will be the perfect opportunity to get trained up and ready to go for those certifications! I highly recommend this course, check out the details here. BTW, I'll be attending Tech Ed in Sydney this year and you'll find me presenting in the MVP Theatre and assisting in the Hands-on labs.